A U.S. government employee in southern China suffered a brain injury after reporting strange "sensations of sound and pressure,” a strikingly similar account to what American personnel experienced in recent years in Cuba, State Department officials said on Wednesday. In a health alert to American citizens in China posted online Wednesday, the U.S. Embassy and Consulates in China said an employee stationed in the sprawling port city of Guangzhou had "recently reported subtle and vague, but abnormal, sensations of sound and pressure." The cause of the reported symptoms remains unknown. "The U.S. government is taking these reports seriously and has informed its official staff in China of this event," the U.S. Embassy said in the alert. 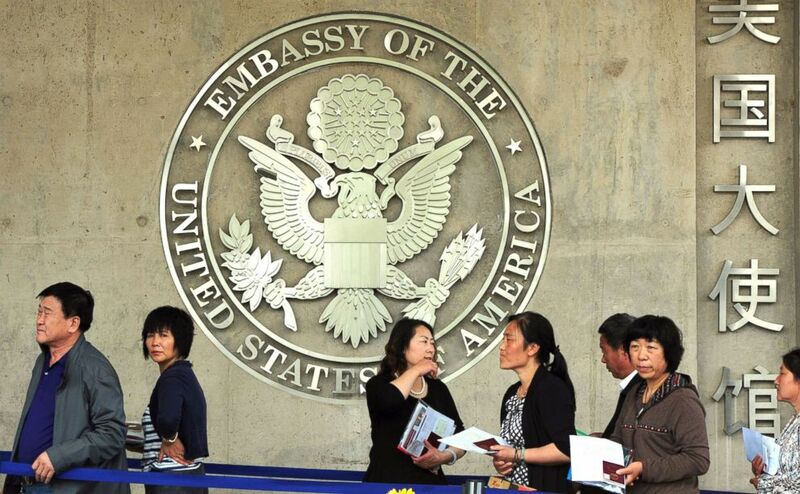 Jinnie Lee, a spokeswoman for the U.S. Embassy in Beijing, told ABC News in an email that the Guangzhou employee reported experiencing a "variety of physical symptoms" starting late last year and continuing through April. The unidentified individual was sent to the United States for further evaluation. The embassy was informed on Friday that "the clinical findings of this evaluation matched mild traumatic brain injury," according to Lee. "The Department is taking this incident very seriously and is working to determine the cause and impact of the incident," Lee said in the email on Wednesday. "The Chinese government has assured us they are also investigating and taking appropriate measures." 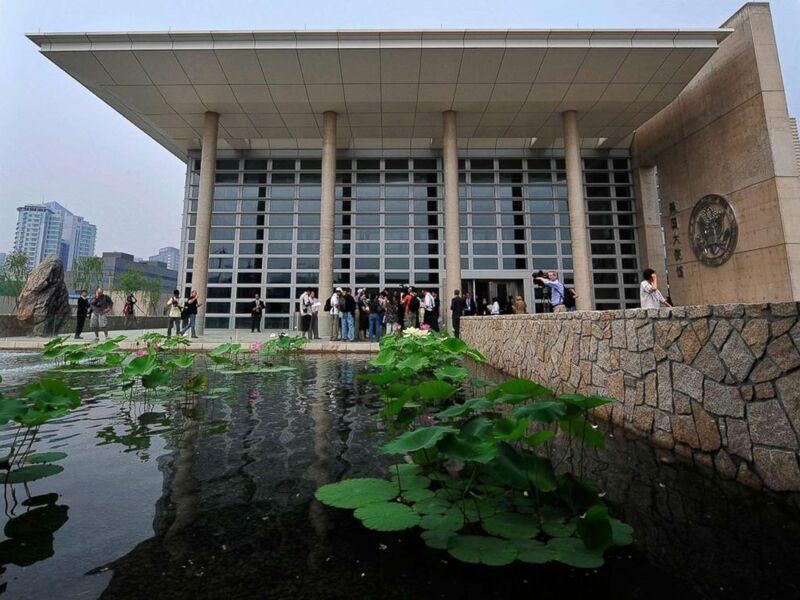 A cyclist rides past the Tianyu Garden building where the US consulate in Guangzhou is located in Guangzhou city, south Chinas Guangdong province, May 16, 2013. 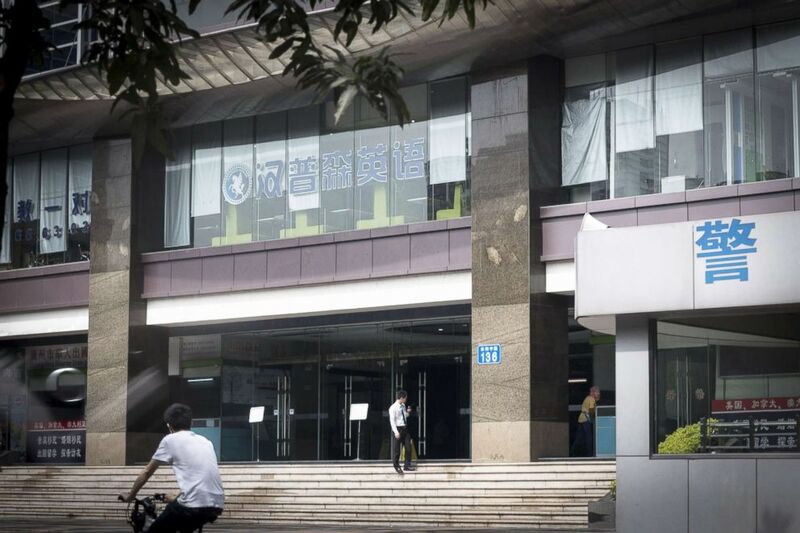 The U.S. Department of State is dispatching a team to Guangzhou early next week to conduct baseline medical evaluations of U.S. personnel who request it, according to spokeswoman Heather Nauert. The U.S. also held town hall meetings at all five consulates in China and the embassy in Beijing, where the meeting was led by Ambassador Terry Branstad, for employees to raise concerns directly with their superiors, Nauert said. China’s top diplomat said officials there have been investigating the incident “in a very responsible matter” and that, so far, they haven’t found any individual or organization responsible. Chinese citizens wait to submit their visa applications at the US Embassy where blind rights activist Chen Guangcheng is believed to be hiding, in Beijing on May 2, 2012. At a press conference with U.S. Secretary of State Mike Pompeo in Washington D.C. on Wednesday afternoon, China’s State Councilor Wang Yi said China will remain in communication with the U.S. over the incident, encouraged the U.S. to conduct its own investigation, and affirmed China’s commitment to the health and safety of foreigners, especially diplomats. But he also urged that the incident not be “magnified, complicated or politicized,” saying it shouldn’t be associated with other issues between the two nations. Pompeo praised China’s response, saying the country has offered to assist the U.S. investigation. “We have notified China of what took place as best we know it, and they have responded in a way that is exactly the right response,” Pompeo said. Local and foreign journalists visit the new US embassy in Beijing on Aug. 5, 2008. Speaking earlier on Wednesday before the House Foreign Affairs Committee, Pompeo said the reported symptoms in Guangzhou are "very similar and entirely consistent" to those experienced by U.S. embassy personnel staff in Cuba's capital city in 2016 and 2017. At least 24 Americans in Havana experienced a range of medically-confirmed neurological symptoms that have lasted for months, often after hearing a buzzing or piercing noise and feeling a sensation of pressure in their homes and hotel rooms. For many, the symptoms began around May 2017. Cuba has denied responsibility and has cast doubt on whether the American personnel did, in fact, suffer the reported symptoms, while the United States has countered that Cuban officials must know who is responsible. In response, the United States withdrew the majority of its staff at the Cuban embassy and expelled as many Cuban diplomats from Washington D.C.
Pompeo also said that the State Department’s internal accountability review board will finalize its report sometime next week on how the agency handled the incidents in Cuba. His predecessor Rex Tillerson has been criticized for being slow to respond to medical issues among State Department personnel in Cuba.